BEFORE: I know, I know. You’re probably thinking who has not seen The Wizard of Oz besides little kids who can’t even walk and talk yet? 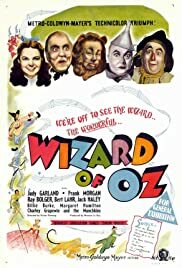 While I can walk and talk, I have never gotten around to seeing The Wizard of Oz. And it’s not for lack of trying. Several years ago as part of my Black Friday movie haul I picked up the blu-ray for quite cheap but the only part I’ve seen is it sitting on the shelf collecting dust. Well today is the day that I stop putting it off for another time and sit down and watch the classic. I’m quite excited to do so but I wonder if I’m going to have an E.T. : The Extra-Terrestrial experience. E.T. was yet another classic film that I had never gotten around to watching, or so I thought. When I finally watched it, about a year ago now, I was shocked with how much of the movie seemed familiar. I remembered so much that it was like I had seen it so long ago, that I had no recollection of ever watching it. AFTER: The verdict: I indeed had never seen this before. Of course I knew the lyrics to a few of the songs (who hasn’t heard someone sing “We’re Off to See the Wizard”) but other than that, it was a brand new experience for me as expected. While I did find the film highly entertaining, I found the extensive use of wide angles, or rather, a lack of close-ups, to detract from the film. While there was an occasional close up of Dorothy (Judy Garland) or one of her companions, the camera stayed with a medium to wide shot. There’s advantages and disadvantages to using both kinds of shots and each has their own use. Wide shots allow the viewer to see how the scene is setup and look at some of the wonderful landscapes in the land of Oz. Close-ups on the other hand bring the viewer right next to the actor so you can see the emotions in their eyes and face. I very much appreciated the many wide shots showing the extensive work done on the sets, but the lack of close-ups left me feeling disconnected from the story and the characters. This can probably be attributed to the method of filmmaking in the 1930s as opposed to a stylistic choice by the director, Victor Fleming. Films were made much differently at the dawn of cinema and the style is drastically different from what we’re used to today. The cinematography here made the film less entertaining for me, but on the other hand, it was interesting to see the old way of doing things and comparing it to modern films. Classics are classics for a reason. The stories are timeless and the lessons they teach us are invaluable. The Wizard of Oz is just one of those films that everyone should see at some point in their life for no other reason than it’s a film that everyone can relate too.